I am a little late getting this posted, and pumpkin pie may not be on the docket for you until next year. However, while the recipe and process is still fresh in my head, I wanted to share this recipe. 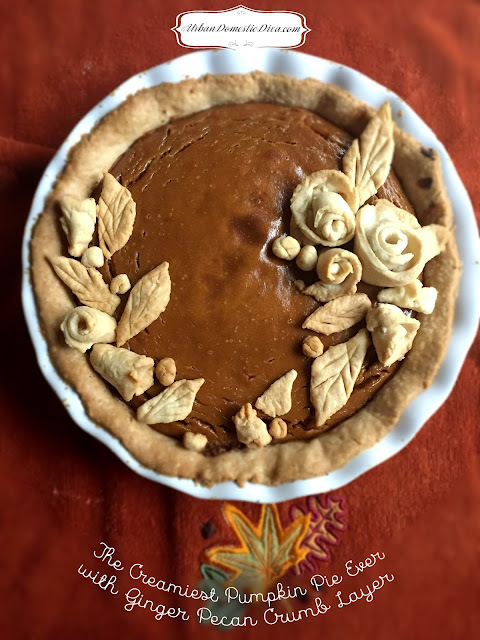 I adapted it from the pie goddess herself, Rose Beranbaum, author of The Pie and Pastry Bible. This book is a great wedding gift to brides who want to become amazing pie makers. I have learned much from her techniques. Sometimes, she goes a little overboard on steps, but there is a lot of science in her baking-as baking truly is a science in many ways. She spent a lot of time baking pies in various approaches to get the perfect recipe for any pie you can dream of. Its a bible for sure, with a thickness to warrant it's title. This recipe does something very interesting with the pumpkin that I urge you not to skip. After cooking the pumpkin mixture on the stove, you puree it until extra smooth in a food processor while adding the rest of the ingredients. Cooking it stove top decreases the water content and melds the spices, and pureeing it creates a silky, creamy consistency that is to die for. Pay close attention to the end of the cooking time. A knife pulled out should come out clean, but the pie should have an ever so slight jiggle to it. If it doesn't and begins cracking at the center, you have cooked it too long. The pie needs to cook slow and long, so the crust should not overhang too far on the pie plate. The crust will not be able to stand up to the long cooking time, so keep it a shorter and tighter crust, closer to the filling. Cover with foil if things get away from you. Finally, I used "Anna's" Ginger Thins because I had a hard time finding Ginger cookies. Ginger snaps or thins works for the crumb. If using thicker ginger snaps, maybe cut the cookie amount by half. Serve with whipped cream or ice cream. You're going to divide the butter into two parts. Basically, chill in the fridge 5 Tbsp. in plastic wrap, and freeze until solid the remaining 3 Tbsp. wrapped in plastic wrap. This takes around 30 minutes. If possible, even chill your flour in a Ziploc bag for the same amount of time. I sometimes skip this if I am feeling less patient, and things still turn out alright. But the idea here is the cooler things are, the more the butter "nubs" stay in tact versus melting too early. As they melt while baking, they leave pockets in the crust, thus creating the sought after "flakiness". In a food processor, pulse the flour and baking powder. Then add the chilled butter and pulse until the butter resembles the size of large peas. Add the frozen butter and pulse until the butter resembles small peas. I use fork tines to lift some of the flour up and see what size the butter bits are every few pulses. Add the vinegar and the first couple tablespoons of chilled water and pulse. The mixture will be crumbly. Press it with your fingers, does it feel like with pressure it will come together? If not, add another Tbsp. of water and pulse a little more. Add water a Tbsp. at a time and pulse until the mixture comes together with your fingers pressing it. Dump the mixture on a large saran wrap covered surface. Using the side of the wrap, push the wrap over the edges of the pile and begin pushing and pressing the dough together using the saran wrap under your hands. Eventually, have the saran wrap cover the dough, and using your hands, push it flat and then shape the dough into a flat, round shape. Work fast, you don't want the butter to melt. Once the dough is a nice shaped flat disc wrapped in saran wrap, place it in the fridge to rest for at least 30 minutes. When ready, take the dough out and let sit for ten minutes on more plastic wrap lightly dusted with flour on a work surface until the dough can be rolled out. Cover the dough with more floured plastic wrap and roll into a circle large enough to fill your 9 inch baking pan. Flip the dough onto your dish, peel the bottom wrap off and gently push the dough into your pan. Trim your edge so that it does not overhang the pan. Use the tines of a fork and press around the edge to create a decorative border, because you don't have a decent overhang to make it pretty. Cover and chill again for an hour. You will have a small amount of extra dough. Roll that out as well, and make decorative leaf shapes for the top. You will cook these separately. Place a foil-covered baking sheet at the bottom rack of the oven, or even the oven floor. Preheat oven to 375˚ for 20 minutes before baking-so I usually get it going while I prep the crumb layer and the filling. Place the ginger cookies and the pecans in a food processor. Pulse until finely ground. Set aside until the crust has been adequately chilled. When the crust is ready, fill the bottom with the crumb layer, and with your hand and the back of a spoon, layer it evenly along the bottom and 1/2 inch up the sides, pressing it gently into the dough. Set aside. In a saucepan, stir together pumpkin puree, brown sugar, spices and salt over medium heat. Bring it to a simmer, then reduce to low and stir until thick and shiny-about 5 minutes. Scrape the mixture into a food processor and puree for 1 minute. While on, add the milk and cream until combined. Stop and scrape the sides, then continue while adding the eggs, one at a time, processing 5 seconds after each addition. Add the vanilla with the last egg. Pour the filling into the waiting pie shell. Set it on the waiting, heated baking sheet, and bake for 60-80 minutes or until a knife inserted between the sides and center come out just about clean. There also will be a jelly-like jiggle in the center of the filling just before it is done. It will have puffed up and the surface will have dulled. If it does not have the "jello jiggle" in the middle, you can be sure it is not near done. The jelly jiggle is like an alert that it is almost done. So keep an eye on it and test it with a knife shortly after the jiggle test. Also, don't forget your leaf decorations you made with the extra dough. Bake the decorations on a separate baking sheet on the middle rack until lightly golden. Let cool completely. When the pie is done, place on a rack to cool and set completely. After ten minutes of cooling add your cooked pastry decorations you baked separately on the top. They will settle in and stick, and look as if they belonged there all along! Happy new year, and a successful 2011 to everyone! You too Marianna and to all my followers and visitors! Happy New Year! I hope 2011 brings good things to us all!